Dust work surface with corn starch. Cut out a stencil of Bill Murray's image. Set stencil on fondant covered cake. Roll black food coloring over stencil. Allow food coloring to dry. What would you do if you had to relive the same day over and over again? I'm sure, much like Phil, Bill Murray's character in the movie Groundhog Day, we'd all stress out at first – but then realize how we could use the do-over to our advantage! Bill Murray's hilarious antics in the film have movie fans watching him relive Groundhog Day over and over year after year. To celebrate this classic cinematic gem and the upcoming holiday, I created a stenciled cake featuring a shadowy image of Bill. This cake is really impressive-looking, but is actually quite simple to do using a stencil. Of course, I don't know where you'd find a stencil of Bill Murray, so you'll have to cut one yourself – I'll show you how. You'll need to buy a clear stencil sheet from a craft store. Print out an image of Bill Murray in the size that will fit the top of your cake. Tape it to a cutting board and tape the stencil sheet on top of it. Use a sharp craft knife to cut out all of the dark areas on the picture. Remove all of the cut pieces so you have a nice stencil. Now you can use it to decorate the top of a fondant-covered cake. Bake any flavor cake mix you prefer in two 8 or 9 inch round pans. Stack them, layered with frosting in between, and frost around the outside. Be sure to smooth out the frosting well. Measure your cake across the top and sides then add 2 extra inches to that. So if your cake is 3 inches tall by 8 inches wide you need to roll your fondant out to 16 inches. For this size cake, start with 24 ounces of fondant. Knead the fondant until it is soft and pliable. Lightly dust your counter top with cornstarch. Roll fondant out using a rolling pin. Lift and turn your fondant as you are rolling to make sure it isn't sticking to the counter top. Add more corn starch if needed. Continue to roll it until you achieve the desired dimensions (16 inches for my cake). Carefully roll the fondant up onto your rolling pin. Start with fondant at one side of cake and unroll it over the cake. This technique is much easier than trying to lift a large amount of fondant with your hands and draping it over the cake. Work your way down from the top of the cake, smoothing out the fondant with your hands. Start by smoothing out the fondant on the top of the cake, then around the top edge of the cake, then move down to the bottom edge. As you work the fondant around the bottom edge, you'll need to pull the fondant away from the cake a bit with one hand and smooth it against the sides of the cake with the other, working out the pleats as you go around the cake. Go around the entire cake using a fondant smoother. Trim around the bottom edge of the cake, removing excess fondant. Place the cake on your cake plate. Scoop out some black icing color onto a paper plate. Roll a new or food use-only sponge roller brush (also found at the craft store) in the black coloring, evenly covering the roller. Roll the coloring over the stencil. 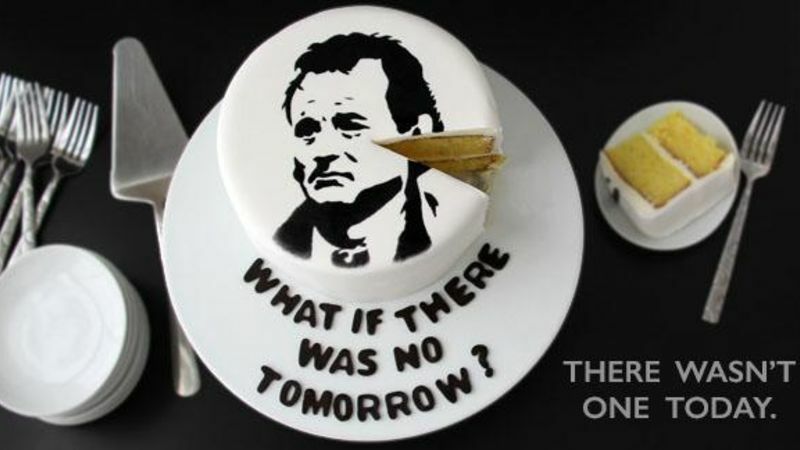 Once you've covered the entire stencil, lift the stencil off the cake to reveal Bill Murray. Allow the food coloring to dry. Store cake at room temperature until you are ready to slice and serve. For fun, you can even cut letters out of fondant to spell out "What if there was no tomorrow? There wasn't one today." Enjoy! Looking for some fondant tips? Check out this easy tutorial on How to Use Fondant.